The Wilmington Blue Rocks front office was out in the community on Thursday as they participated in Operation Warm at Warner Elementary School in Wilmington. The event, which was presented by Harvery Hanna and The Delaware Kids Fund, provided local children with brand new winter jackets. Kids would walk into the school's cafeteria, introduce themselves to a volunteer from the community and then get the opportunity to pick out a jacket of their choice courtesy of Operation Warm. They then received a kindness coin and signed a giant thank you poster for the generous folks at Harvey Hanna. "It was an awesome event," said Blue Rocks Director of Merchandise Jim Beck. "The kids were so grateful and it was just a terrific opportunity to speak with them, get to know them a little bit and then play a very small part in putting a smile on their faces. We want to thank both Operation Warm and Harvey Hanna for giving our organization a chance to be involved." 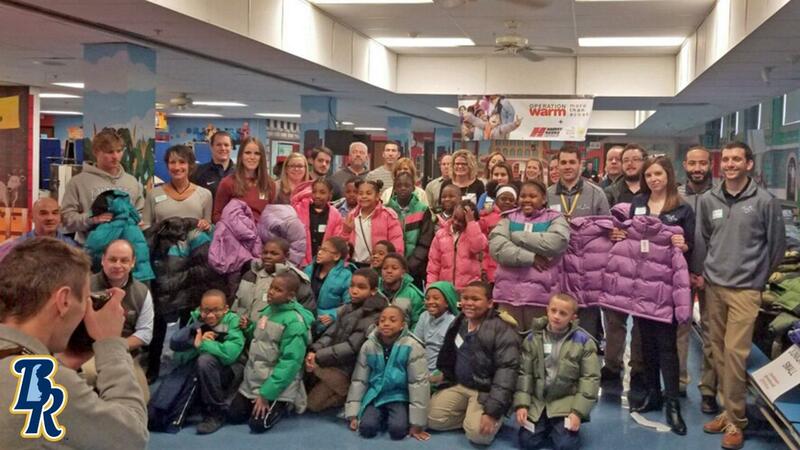 Operation Warm provides warmth, confidence and hope to children in need through the gift of brand new winter coats. The organization believes a brand new coat is more than a coat. Through serving millions of children in need across North America, it has seen that a brand new coat offers a child physical and emotional warmth, confidence to socialize and succeed, and hope of a brighter future. For more information on the organization their website is OperationWarm.org. The Blue Rocks were honored by the Carolina League in 2018 with the Matt Minker Community Service Award. The award goes to the club which best demonstrates an outstanding, on-going commitment to charitable service, support, and leadership within its community. The award is named after the Blue Rocks' founder, Matt Minker, who owned the club until his death in 2007. Minker, whose construction company built Frawley Stadium, remains the team's honorary president. The Blue Rocks participated in numerous school programs, charitable endeavors and hospital visits in 2018 and team works with area schools to promote academic achievement (DSEA Rocky's Reading Challenge), citizenship (Grotto Pizza Outstanding Student Program) and overall knowledge (Discover Baseball and Education Day). The organization also helped raise hundreds of thousands of dollars for good causes such as Habitat for Humanity, Fight for the Gold, Boys and Girls Clubs of Delaware, Special Olympics Delaware, Food Bank of Delaware and many other charities through partnerships with local businesses such as Chase and Food Lion. Several times during the season, the team's players and mascot also visited local hospitals, brightening the spirits of patients and their families. The Blue Rocks recently announced a two-year extension of their Player Development Contract to remain the Advanced-A affiliate of the Kansas City Royals. Season seats, mini plans and group packages for the 2019 season are available now at BlueRocks.com.